The very first Sons and Daughters DVD, subtitled The Best of Pat the Rat, was released by Umbrella Entertainment in Australia on 9 October 2006. The two-disc set was released as non-region-specific, meaning it can be played on standard DVD players all over the world. Copies can be bought from the EzyDVD website. As the name suggests, the set is dedicated to the character that arguably ended up overshadowing all the other characters - certainly in the first two or three years of Sons and Daughters' run, anyway - Patricia Hamilton/Morrell/Palmer and her 'alter ego' following plastic surgery, Alison Carr. A review of the DVD appears further down this page, but first, full details of the contents of the DVD. Over the years that this website has been running, one of the questions that has come up most frequently is 'Are there any videos or DVDs of Sons and Daughters?' Needless to say, I always had to respond in the negative - so to see a DVD set released at long last is certainly a cause for celebration. 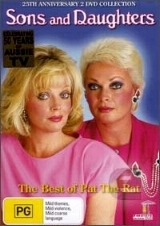 There's no denying that the character of Patricia became overwhelmingly popular when Sons and Daughters aired originally in the 1980s - as recognised when Rowena Wallace won the Gold Logie for her portrayal of this complex character - so it's appropriate that this DVD set focuses on the character of Patricia and her later post-plastic-surgery reincarnation as Alison Carr. The set begins - as one would hope - at the beginning, with Episodes 1, 2 and 3, where we get to see Patricia (played by Jackie Woodburne) giving birth to the twins, John and Angela, in 1962. Time then jumps forward twenty years to 1982 and Rowena Wallace's first appearance as the character fans loved to hate. The on-screen menu advertises these first three episodes as the original 67-minute beginning to Sons and Daughters - which makes it rather surprising that they're carved into three separate episodes with the Sons and Daughters logo appearing on-screen for several seconds between each episode. Why not just show the entire 67-minutes in one go? We then have a selection of episodes from the first (1982) season, focusing mainly on the twins and Patricia's early attempts to ensnare David. From the perspective of a viewer in the UK, it's great to see the closing credits for each episode in their entirety, including the Travelodge and Grace Bros. captions! Towards the end of this first disc, there's a huge jump from Episode 121 to Episode 501, meaning there's a good two years' worth of Patricia-related storylines missing. Patricia's neuroses grew as time went by, and I think she would have been served much better as a character in this set if episodes had been included focusing on her time with Stephen Morrell, her battles with Dee Morrell and the aftermath of Dee's death. Still, maybe they'll make another DVD set (fingers crossed!). The final episodes on the first DVD cover some of Patricia's battles with Roger Carlyle and her escape to Rio. The second DVD then begins with Patricia in Rio, undergoing plastic surgery, and her subsequent return to Australia under her new identity, Alison Carr. We see Roger Carlyle and then David working out that Alison is really Patricia - before there's another big leap in episodes, from Episode 693 to Episode 905, representing just over a year's jump. The DVD set ends with Rowena Wallace's return to Sons and Daughters as Pamela Hudson, Patricia's never-before-mentioned identical twin sister. Episode 944 is the final episode to feature in this set - the one where Pamela stares into space a lot as she tries to use her 'telepathic' link to her twin to kill Alison as she drives along in her car! I can't help feeling that the proper final episode of Sons and Daughters (Episode 972) would have been a better one with which to finish the set, as it would have shown Alison at rock-bottom, but then rescued by the one man who'd always loved her: David. The Patricia story would have been brought full-circle, as happened on-screen. Still, it was always going to be difficult to pick a representative sample of episodes focusing on such a huge, multi-faceted character, and I can't deny that watching the episodes on these DVDs is forever entertaining. Of the extras, the commentary on Episode 693, by former Sons and Daughters stars Tom Richards (David Palmer) and Belinda Giblin (Alison Carr), together with TV historian, Andrew Mercardo, is great fun to listen to, and it comes across quite clearly that both Tom and Belinda have fond memories of their time on the show - even if Belinda sounds rather horrified now at the shoulder pads she wore and the way her hair was styled! The other main extra of note is a gallery of various Sons and Daughters publicity photos, played to the full-length version of the theme tune. I couldn't help thinking that some of these photos looked rather squashed, but it's good to recall some of the characters other than Patricia in this way. The DVD set itself is presented well enough. However, I can't help being disappointed that all the photos on the front and back of the DVD case - as well as on DVD One - are of Rowena Wallace during her 'Pamela' days, rather than her 'Patricia' days; the nearest we get to seeing 'Patricia' is on a small photo that Alison is holding on the inside of the set. This does seem to defeat, slightly, the idea of this being a boxset devoted to Pat the Rat. I also couldn't help noticing both on the inside cover of the DVD and on the on-screen menus on the DVDs themselves that 'Carlyle' - as in Roger and Luke - is misspelt as 'Carlysle'; and the description for Episode 905 - 'In jail, Beryl meets Pamela - who is the spitting image of Alison' - should surely state that Pamela is the spitting image of Patricia? Despite these gripes, I am, of course, delighted that there are finally some episodes of Sons and Daughters available on DVD. I'd give this boxset 4 out of 5. Umbrella Entertainment is looking for suggestions for episodes or themes that could be included on future Sons and Daughters DVD releases, so check out http://www.umbrellaent.com.au or e-mail info@umbrellaent.com.au to get in touch.